Boom! 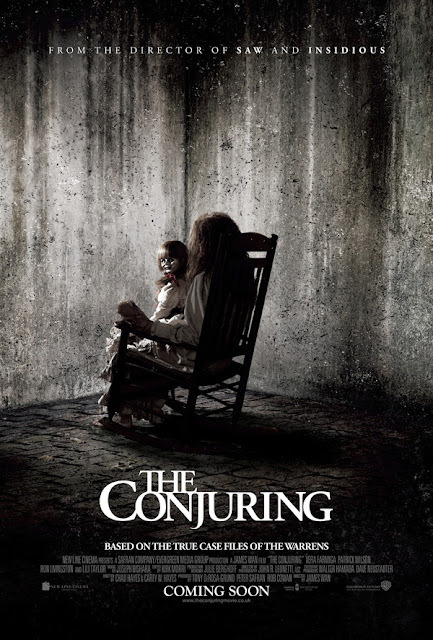 Another movie review is up, and this time I'm reviewing non other than the horror flick, The Conjuring! Caught this the other day with le bb, and I'm not exactly a fan of horror films, so most of the time I was behind the shawl, but I could still see the silhouette of what was happening :p So did I like it? Read on to find out! Synopsis: In 1971, Carolyn and Roger Perron move their family into a dilapidated Rhode Island farm house and soon strange things start happening around it with escalating nightmarish terror. In desperation, Carolyn contacts the noted paranormal investigators, Ed and Lorraine Warren, to examine the house. What the Warrens discover is a whole area steeped in a satanic haunting that is now targeting the Parren family wherever they go. To stop this evil, the Warrens will have to call upon all their skills and spiritual strength to defeat this spectral menace at its source that threatens to destroy everyone involved. I'm not one for horror movies either! In fact Tiiing dragged me and colleagues Raya night to go watch xD We were all screaming our heads off at the slightest things! It was good.